One for the history books. The Brown’s hotel is where Rudyard Kipling wrote the Jungle Book and where Alexander Graham Bell placed the first telephone call. It’s one of those legendary hotels you’ll find mentioned in a history book or two. Rudyard Kipling stayed often and penned the Jungle Book here (earning himself his very own suite in the process) . Agatha Christie too found her creative muse within these walls, and Alexander Graham Bell placed the first telephone call ever here. Yes, a stay at the Brown’s can turn into a history lesson if you choose to ask the knowledgeable staff, but you’ll likely be too busy enjoying it for what it is today and darting about Mayfair to even care. Sleek design elements by Olga Polizzi - colorful upholstery and a curated selection of contemporary art contrasted by dark mahogany woods - make it easy to forget that this Grande Dame is over a 150 years old. So does the friendly atmosphere. 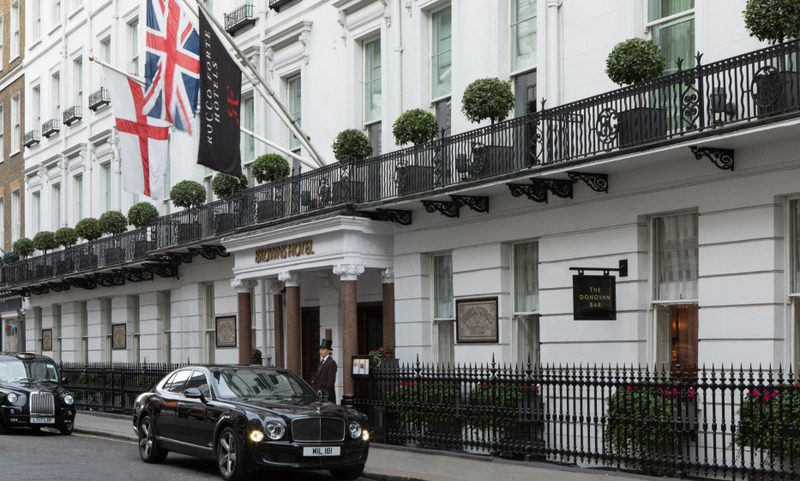 A stay at the Brown’s is made for those who want the full experience of staying in a luxury hotel on Mayfair, but who want to feel comfortable enough to sneak down and raid the honesty bar at night in their slippers. For a treat ( literally ) the hotel’s Afternoon tea in the hotel’s English Tea Room is still one of the best in London, and the Donovan’s Bar is Albermale’s watering hole of choice for the chic and discerning. First ever hotel to open in London in 1837. Kipling, Roosevelt, Agatha Christie and Napoleon III stayed at Brown's. The afternoon tea to be enjoyed by the fireplace. The unique British heritage and feel contrasting with contemporary art and design. Wonderful, Lovely Hotel, The Best ever place to stay in London. My home away from home. The only place I want to stay in London. I enjoyed my stay at the Brown's Hotel very much. This is one of the most beautiful hotels in London. Very well located with a service of very high efficiency and quality. Being a businessman myself and running a large automobile manufacturing facility in Detroit, I know a well run corporation when I see it. The ability to get the type of trained &amp; competent individuals in the right job is always tough. Your Management Team has obviously nailed it as the staff plays out their daily operations at The Brown in a seamless fashion. Well done Management!!! Worth noting, your staff is Happy......and that speaks volumes. The Brown’s hotel feels a bit old school but it’s abundant in charm and it really feels like you’re in England as the service is particularly good. My grandson and I had a great time and I thank my LGem Vanesha for her service. We were very pleased with our hotel experience at Brown's. All staff were terrific and friendly and the service provided was fantastic. I think I finally found the hotel which gives me the feeling of a home from home. This will be my fixed hotel in London from now on. We would recommend Brown's Hotel for many reasons. First and foremost is the staff, well trained and very friendly and capable. Second is the location, within walking distance of so many major attractions such as Buckingham Palace and Westminster Abbey. It is also a beautiful hotel with distinct European flourishes. We have been staying at Brown's many times over the years and it gives us a feeling of coming home. I'm na unconditional fan of the Rocco Forte chain. I know several of them and maybe the Brown's is where the staff is more knowledgeable and attentive. I think I finally found the homely stay I was wishing for. The Dorchester or the Claridge's are so terribly busy when you enter. Here it is calm and the staff is simply exceptionally friendly. After staying two nights in a room which was very noisy, I mentioned that and when I came back for the Lakes to stay another 2 nights, I had the most calm and comfortable room. It was smaller but hey who cares. I was really very impressed and I am sure I will from now on book with Brown's. Very nice hotel, great location but breakfast not at the same level !